The Story of the Matthew Bible: the untold history of the Scriptures that formed the basis of the King James Version. This book will appeal to readers at all levels. Passionate, well-sourced, illustrated, it refers frequently to original (and in some cases, lost) documents, so readers may be sure they are receiving the true history. This is a book that touches the heart and informs the mind. When you reach the last page of The Story of the Matthew Bible, you will have a much deeper understanding of the history of the English Bible and the men who gave it to us – men who gave their lives in the Reformation, for our sakes, that we might have the light of God’s word. “Having read many books on this subject, I can unequivocally state that this is the best yet. This book isn’t filled with trivia, instead it presents the important details regarding the arrival of the Bible in the English language to our shores. It is a fascinating read, one which highlights the fact that the English Bible was thoroughly and truly inspired by the Holy Spirit, even though circumstances, good and bad, were at play. As an ex-Roman Catholic I find myself opposed to ritualism, be it in the form of ceremonies, sacraments and feast days. Nevertheless, I fully appreciate that the early reformers adhered to some of the old ways they had learned from Rome. Whilst I may not agree with the author on the level of Lutheranism, I can without hesitation stand firmly alongside her regarding the sacredness of Scripture. “I found this book gripping. There were parts which I initially thought were going into too much detail, but as I kept reading I saw how vital all the parts were and how they hung and fitted together to make the whole story really exciting. While reading it I became more and more immersed in and able to appreciate the cultural/spiritual atmosphere of that period in the 1500s. My previous studies of Christian history had never given me such a close sense of that atmosphere. “With “The Story of the Matthew Bible”, Ruth Magnusson Davis has finely crafted an easy-to-read but scholarly-sound tome, detailing the history of what is likely the greatest Bible ever printed in the English language. Having read MANY books on the history of the Bible in English, I can honestly say that Ruth’s stands with the best of them. David Daniell’s hefty textbook gives us an incredibly deep overview of the topic from the Dark Ages through to modern times, and Donald Brake offers concise but current information with hundreds full color photos, but Davis intently focuses on the three men who gave us the Matthew Bible: William Tyndale, Myles Coverdale, and John Rogers, and how their work and contributions still affect us today. 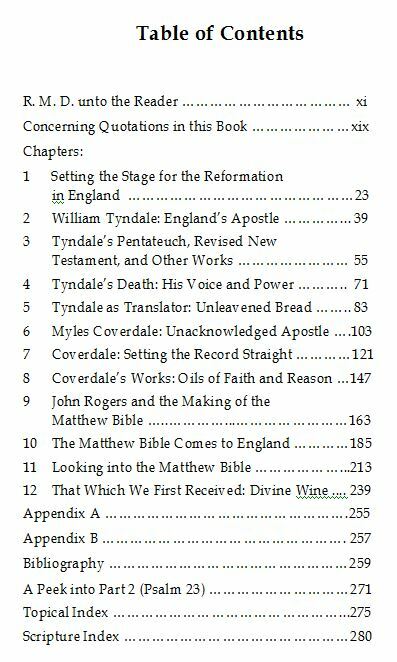 While all three translators are given multiple full, meaty, and well-researched chapters, what I especially enjoyed were the chapters related to Myles Coverdale, a man who has been greatly under-appreciated by modern scholarship. Davis has taken the most modern, updated information available on these men and their works, and given us a solid build-up to their combined magnum opus, the Matthew Bible. The book includes many pictures, as well as useful citations and a full bibliography and topical index. Not only does Davis write factual statements ABOUT the Matthew Bible, she also makes solid arguments with examples on WHY it’s so great. “Ruth Magnusson Davis has done real yeoman’s work here in putting together this history. I had the privilege of proofreading an advance copy and found very little to critique. It became clear to me that the author took great care to go back to the original sources such as an early edition of John Foxe’s Acts and Monuments of the Christian Church (not the modern, bowdlerized Foxe’s Book of Martyrs which are typically heavily redacted and condensed) and the writings of William Tyndale, Myles Coverdale, John Rogers, Thomas Cranmer & Thomas Cromwell and other sources of antiquity from the English Reformation period. For me as a Lutheran, I knew that Luther had played some role in the English Reformation, but only knew so much. Since reading Ruth Magnusson Davis’ book, I now have a fuller understanding. I checked her history of this against Luther’s Works and several histories published by CPH (Concordia) and others and concluded that she has done her homework on the connections between Luther, Barnes, Tyndale & Frith. It was a very satisfying discovery for me. It also was hard to put down at times. The author clearly has a passion for her topic, she is a traditional Anglican who is fond of Luther and other Reformers. “The Matthew Bible of 1537 was a significant precursor to the later Authorised Version of 1611. 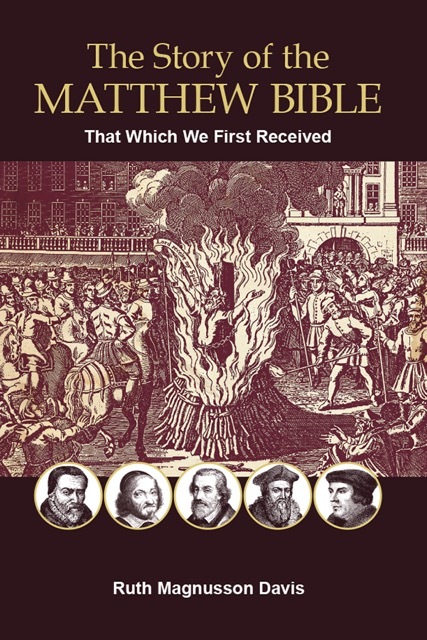 This is a well researched history of the events and persons involved in the publishing of the Matthew Bible that played such an important part in the English Reformation. It features the lives of William Tyndale, Myles Coverdale, John Rogers, Thomas Cranmer and Thomas Cromwell and many other less well known figures. It’s a vivid and passionate account of these heroes, several of whom paid with their lives to bring the Scriptures in the English language to our nation. There are ample quotations from the laws of England, personal letters, other books and especially the Bible. The author founded the New Matthew Bible Project in 2009, dedicated to generating a lightly updated Matthew Bible for today’s readers. The New Testament was published in 2016 as “The October Testament”. I have a copy of that too. “The Story of the Matthew Bible” is actually Part 1 of what will be a two part series. Part 2 is in preparation, and will be added to my wish list.